This long-awaited release of the Don Reitan Quintet exults in the spirit of early '60's Gulf Coast jazz, when the scene was truly happening! 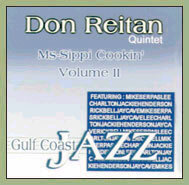 Pianist extraordinaire Don Reitan was a vibrant performer--a master of chord progressions--and an innovative composer who made his mark in the early '60's jazz explosion on the Gulf Coast. This second live volume from Chez Joey swings as hard as the first, balancing spirited performances by each of the players, and reaching an apex with Reitan's own high-energy "Orbit." "...imaginative extemporizing by Rick Bell on tenor." Devoted to Gulf Coast jazz. "...an energetic pianist who departed this world far too soon." 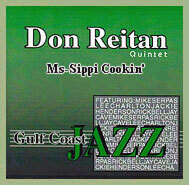 More great jazz from Don Reitan's reign at Chez Joey is on Volume I at FrontBurner CDs. This page was last revised on 10/14/07.